Colonel Sanders, the founding father of fast food fried chicken - his first Kentucky Fried Chicken opened in Corbin, Kentucky - might not be willing to reveal his super-secret recipe of 11 herbs and spices, but if you're really nice he might be willing to share his bucket of chicken. This POP! 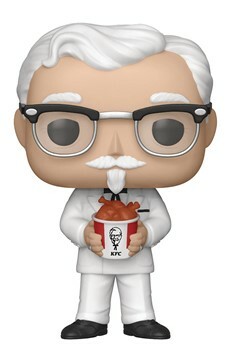 Icon, his iconic white suit, and a bucket of KFC chicken make a congenial and gentlemanly addition to any collection. Figure stands 3 3/4' tall. Window box packaging..